The staff at Putnam Heart Center is dedicated to providing quality care in a comfortable environment. Our commitment is to be the best that we can be when patients entrust their care to us. Meet our staff: Chris Kenney, Blanca Albarran, Donna Gillman, Maria Wester, Dr. Mukesh Goel, Felicia Betterton, Chelsea Mote, Mike Meyer, Shannon Lohnes, Karen Young, Elizabeth Messom. We are here to help! Please let us know how we can assist you! Mukesh Goel, M.D. is the President and founder of Putnam Heart Center and Cardiac Catheterization Laboratory. Dr. Goel is an Interventional Cardiologist trained at the Brigham and Women's/West Roxbury Veterans Hospital, Harvard Medical School, Boston, Massachusetts. He is the co-author of many articles and abstracts pertaining to acute coronary syndrome, thrombolysis, and coronary blood flow following angioplasty/stent procedures. 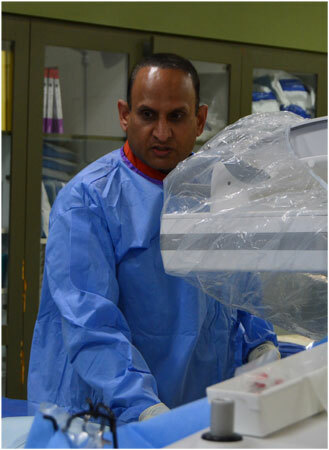 Dr. Goel has performed thousands of diagnostic cardiac catheterizations. He was the first specialist in invasive cardiology in Palatka. He is affiliated with Putnam Community Medical Center in Palatka, Florida. Dr. Goel came to Palatka, Florida in January 1999 as the first specialist in Invasive Cardiology with a vision to promote quality specialized healthcare. He pioneered the Heart Center and cardiac catheterization laboratory type services here in Palatka for our community; the services for which patients previously traveled more than 40 miles by ambulance. Dr. Goel is married and has three children.